After our Monday breakfast at Square Cafe, we went to the Three Rivers Arts Festival. With me in the wheelchair, we frequently try to plan our outings to avoid crowds and we figured a weekday morning/afternoon would be much better than any time on the weekend for the Arts Festival. The last time I was at the Arts Festival was about 6 years ago and it was very tough to get around in the wheelchair, not just because of the crowds but because of the heavy cables and other stuff laying across the pavement. 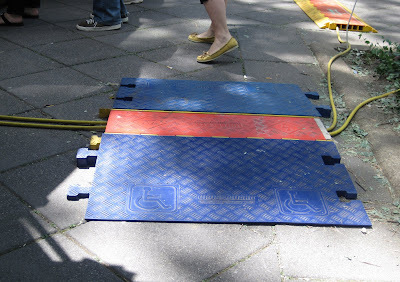 Every time we encountered those fat cable areas, we had to turn the wheelchair around and go over them backwards since the front wheels couldn't get up & over the humps. Not fun. That's why I was especially happy to see these this time: These little ramps made life so much easier!!! We had a lovely time looking at the art and there were many pieces of art which we would have liked to purchase, but in the end, our only purchase was this: Funnel cake. 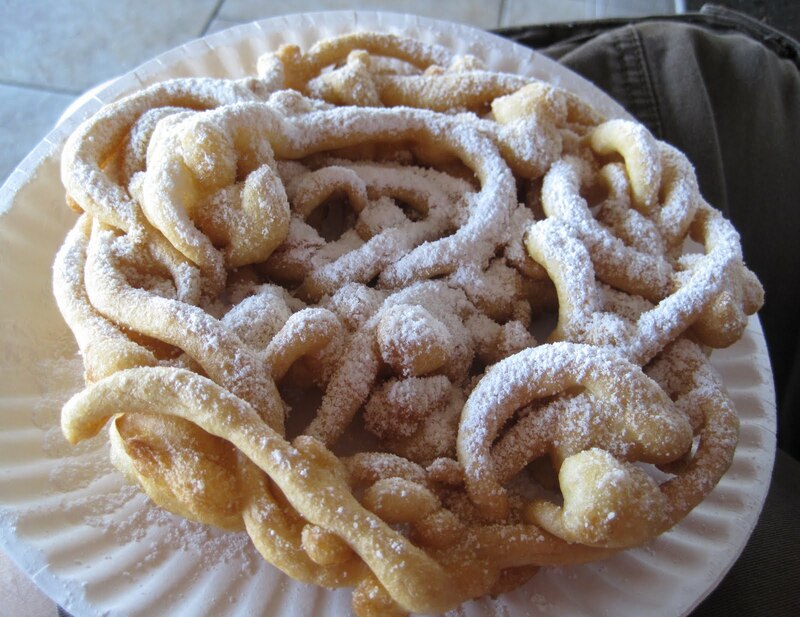 I love funnel cake. This was tasty and doughy - but it also cost $6.50, which I thought was ridiculous for a funnel cake. SP had to have a drink and since we forgot to grab bottled water before we left the house, he paid $3 for 20 oz Diet Coke (bleah). I am not a fan of soda and especially not diet soda! I sort of wanted a lemonade, but between the $10 parking and $10 on funnel cake & soda, I figured we had spent enough during our slightly more than 1 hour at the arts festival! But it was a really nice day, sunny and not too warm. I love the new ramp things (which may have been in use for a few years now, I just haven't gone to the arts festival for many years) and I got to eat funnel cake, which I love. So it was a nice time in the sunshine!